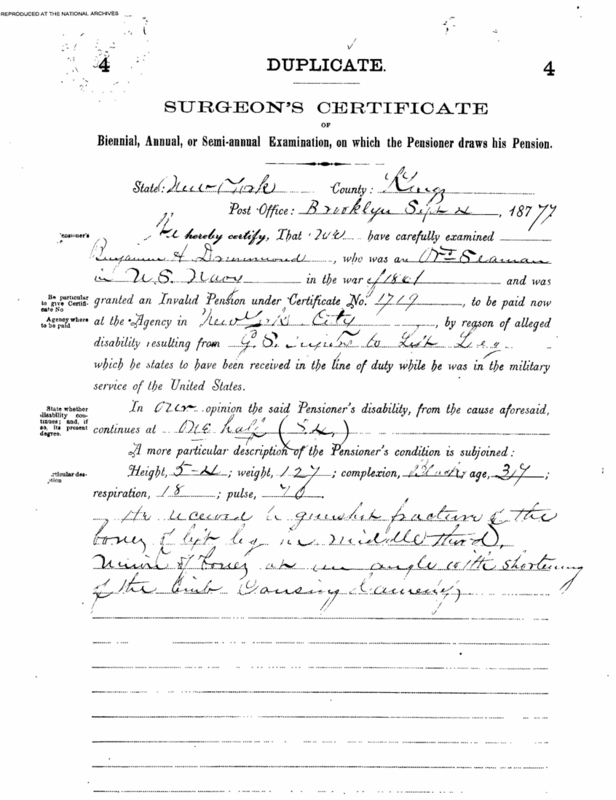 Copy of the 1877 Surgeon's Certificate of Pensioner Examination confirming that the wound to his left leg was received in the line of duty while in military service and that Benjamin Drummond continued to qualify for a pension at the rate of fifty-percent disability. This is a digital copy of the original record held by the National Archives. of Biennial, Annual, or Semi-annual Examination, on which the Pensioner draws his Pension. Benjamin H. Drummond, who was an Ord Seaman in U.S. Navy in the war of 1861 and was granted an Invalid Pension under Certificate No. 1719, to be paid now at the Agency in New York City, by reason of alleged disability resulting from G.S. injury to Left Leg which he states to have been received in the line of duty while he was in the military service of the United States. In our opinion, the said Pensioner’s disability, from the cause aforesaid, continues at one half ($4). Height, 5-4; weight, 127; complexion, Black; age, 34; respiration, 18; pulse, 70. He received a gunshot fracture of the bone of left leg in middle third. (Illegible) of bone on an angle with shortening of the limb causing (illegible).